jeu de stratégie multijoueurs sur la guerre entre la Prusse et l'Autriche en 1756. Therefore he makes a preemptive strike against Saxony, which surrenders weeks later. But this is only the first chapter in what would become known as the Seven Years War! Prussia is completely encircled by her enemies, the biggest continental powers in Europe. England and Hanover are her only allies. – For Prussia, the situation is easy to sum up: To be or not to be. Soon the Prussian House is burning. France has conquered Northern Germany. Austria has invaded Silesia. Russian hordes are crossing the River Oder, and Berlin is a mere five days march away! Frederick is relentless. He desperately rushes from crisis to crisis within his strategic triangle, managing to check one enemy only as another takes advantage of his absence to advance. After six long years of struggle, Prussia seems doomed to fall . . .
Frederick is saved by a miracle. The Russian Tsarina Elisabeth dies, and her successor has an almost infinite adoration for Frederick, and immediately makes peace. Sweden soon comes to terms, followed one year later by a bankrupt France. – Prussia is saved. 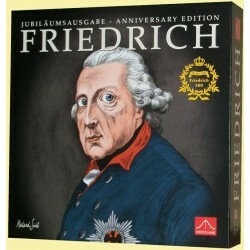 So in the game FRIEDRICH for 3 or 4 players: All against one. But only one will reign supreme. 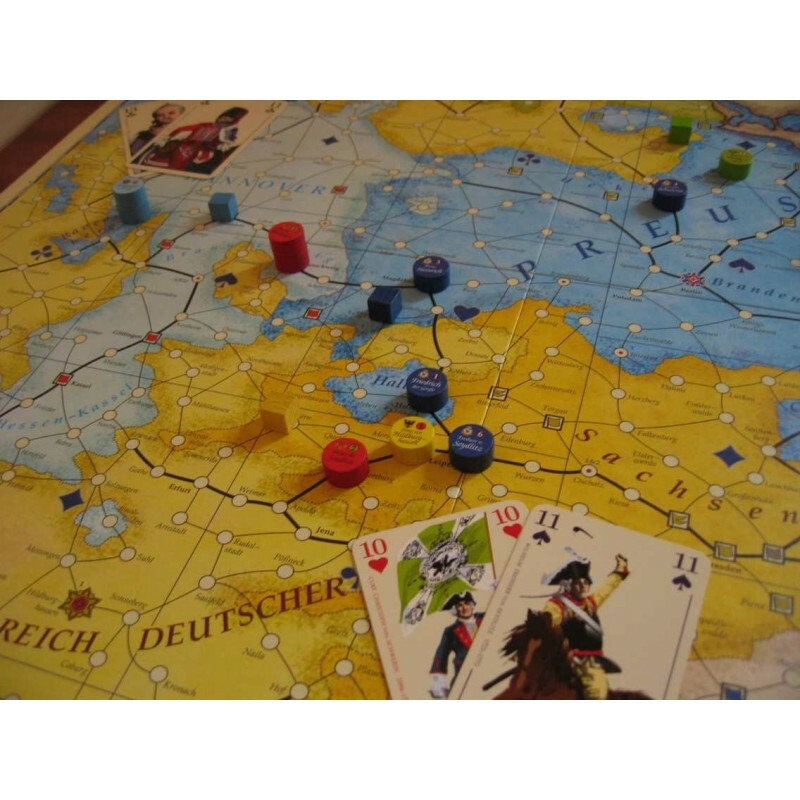 On a map of Old Europe, players manoeuvre their generals from city to city. Frederick must retain a part of each Prussian province, while the attacking powers savagely seek out their objectives. The clever use of tactical cards is decisive to winning. Celebrating the 300th birthday of Frederick the Great, Histogame presents the anniversary edition of the award-winning FRIEDRICH. Uniting the fascination of board and card games, FRIEDRICH and its unique and novel concept offer wide open spaces for brilliant chess-like moves and deep decision making. Accurately based on history, while maintaining a slim set of rules, FRIEDRICH takes you right into Frederick's era: an exciting experience of Prussia's struggle for survival.